Hi Cake Friends!! It's my hubby's birthday and I wanted to surprise him with a homemade version of his favorite dessert... Zebra Cakes!! Mmmmm!! 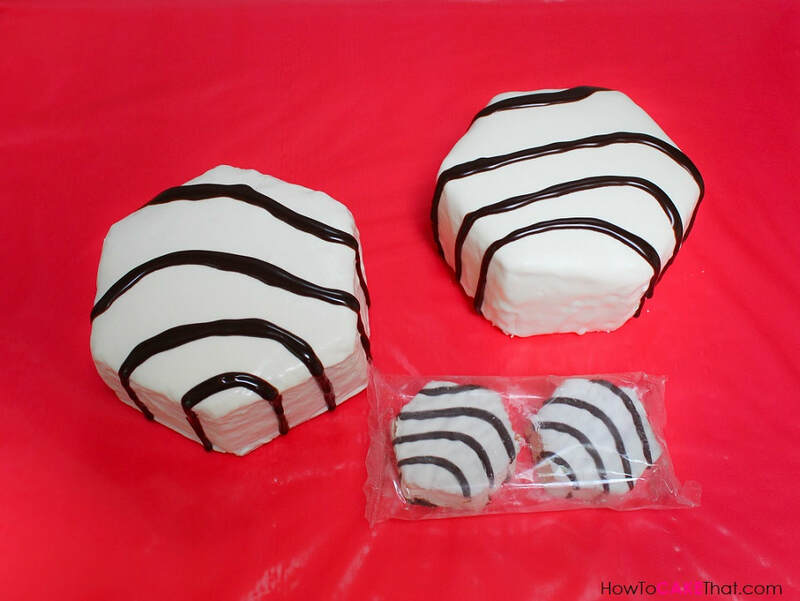 So to make it extra fun I decided to make a jumbo set of zebra cakes to look just like his favorite Little Debbie snack cake! 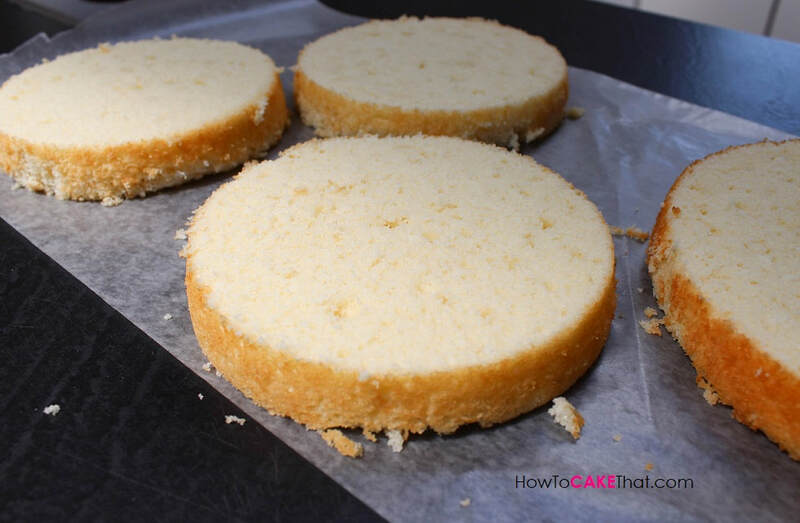 Next, I used my Wilton Cake Leveler to level all 4 layers of cake so that they were about 1 inch tall. 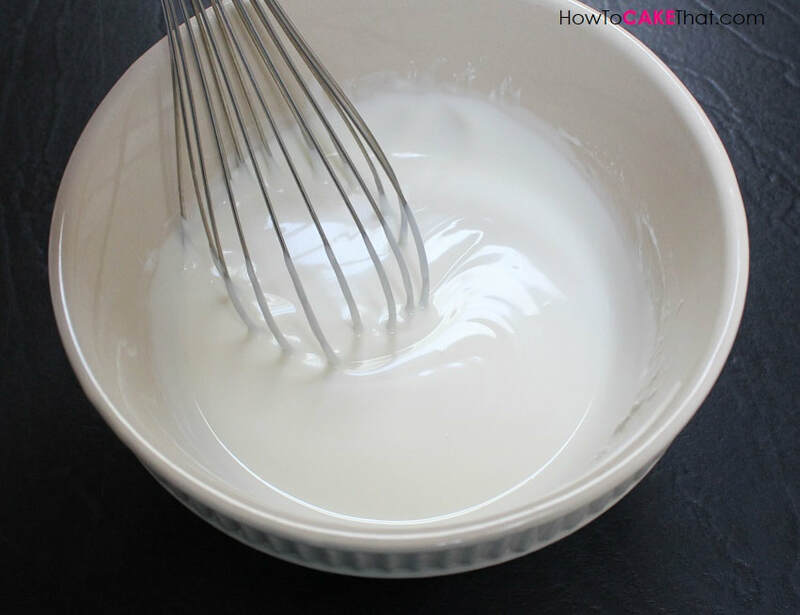 For the cake filling I am using 1 recipe of my Marshmallow Frosting recipe. 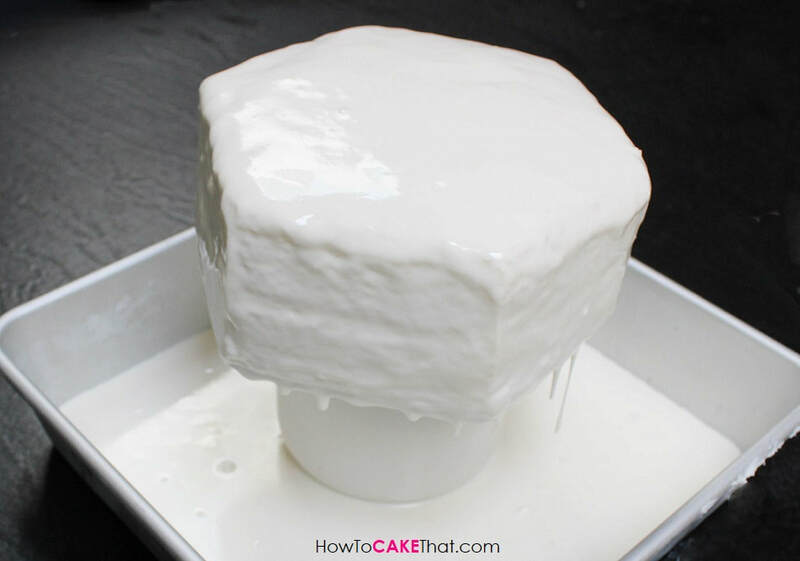 I smeared a small amount of Marshmallow frosting onto a 6 inch cardboard cake round to help my cake stick. Note: My Marshmallow frosting recipe is a little bit soft and sticky, so that makes it difficult to work with. 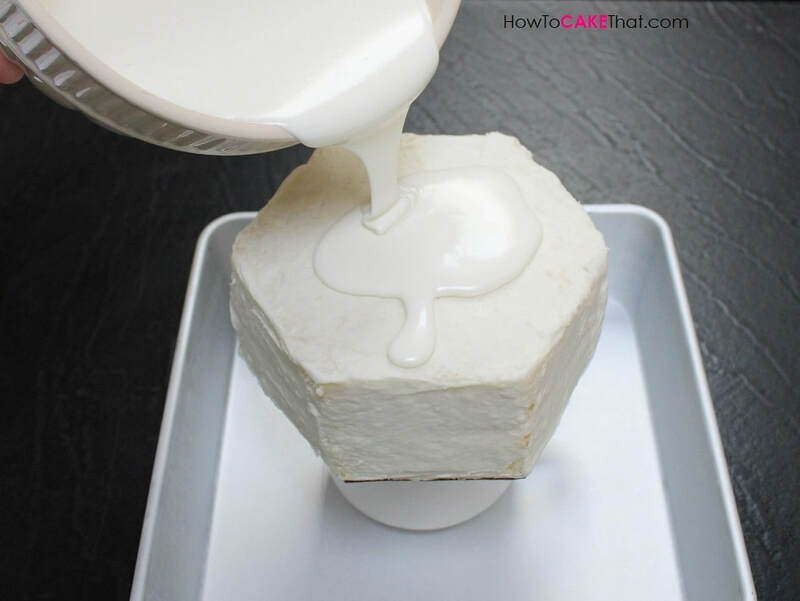 Vanilla frosting can be used in place of the Marshmallow frosting to make life easier ;). 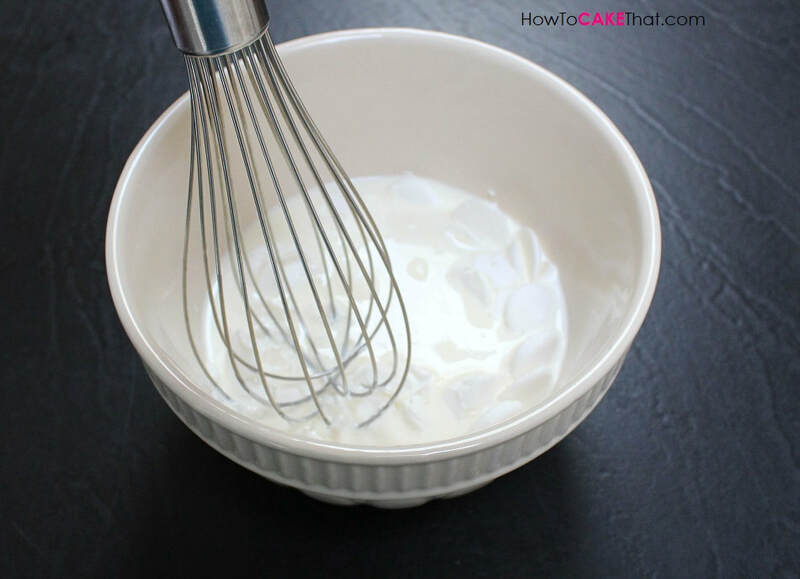 OR another suggestion would be to use my Whipped Buttercream recipe - this one is excellent if you prefer a less sweet, yet light and fluffy option (note: it won't be as white as marshmallow frosting, though). 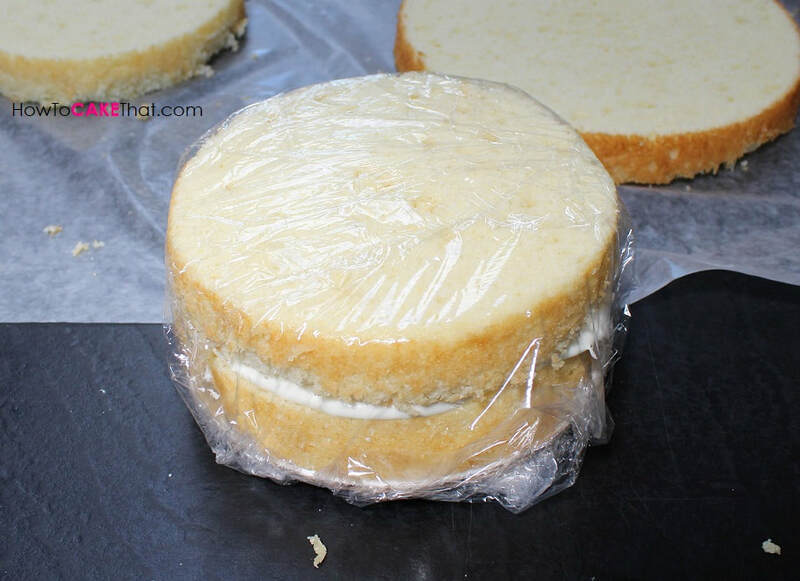 Next, I placed one of the layers of cake onto the 6 inch cardboard cake round. Then I placed a generous amount of Marshmallow Frosting on the layer of cake and spread it until it was nice and even. 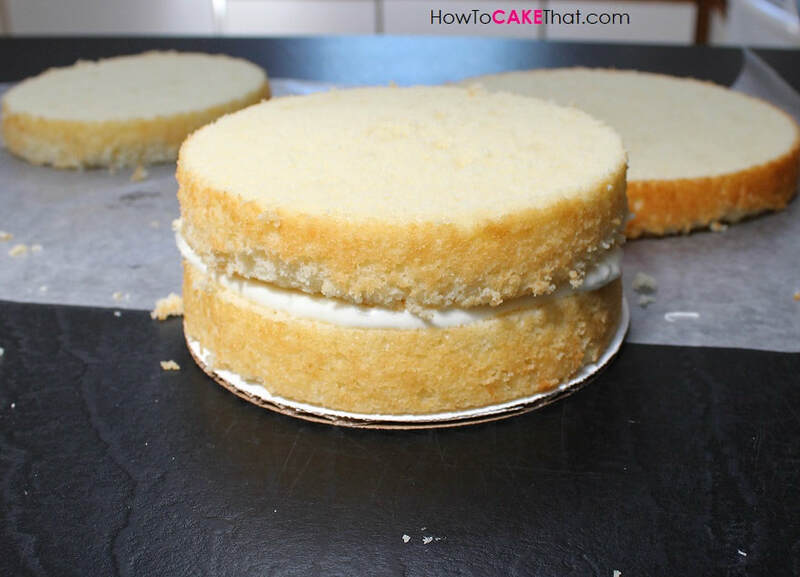 Then I placed a top layer of cake onto the frosting layer. Since the Marshmallow frosting is so soft, I didn't want it squishing out of the cake when I carve it. So I wrapped the cake in plastic wrap and placed it in the freezer until the frosting was almost frozen solid, about 2 hours. After the frosting had a chance to firm up in the freezer, I began carving my cake. Unfortunately I do not have a template for you guys! This cake was just for fun and I just winged it :). Carving a hexagon shape freehand wasn't too hard. 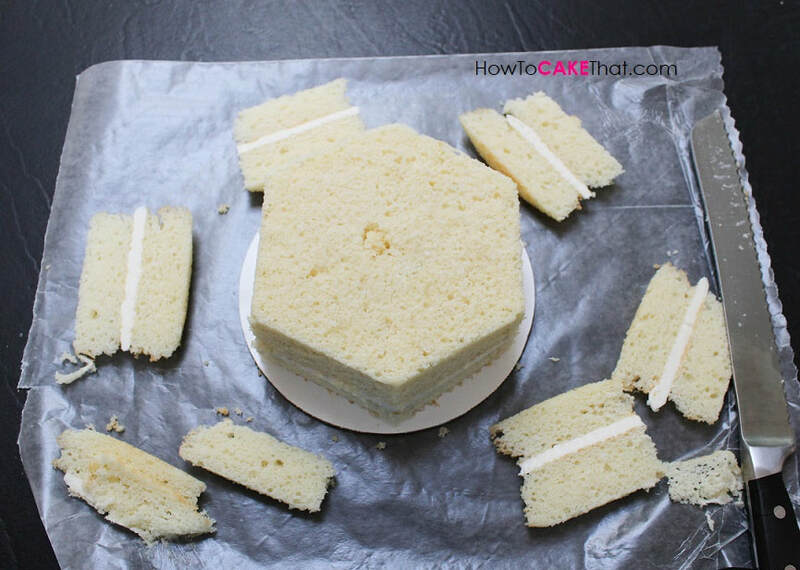 I began by trimming straight edges on the sides, being careful not to cut away too much cake. Remember, you can always take off more cake if needed. 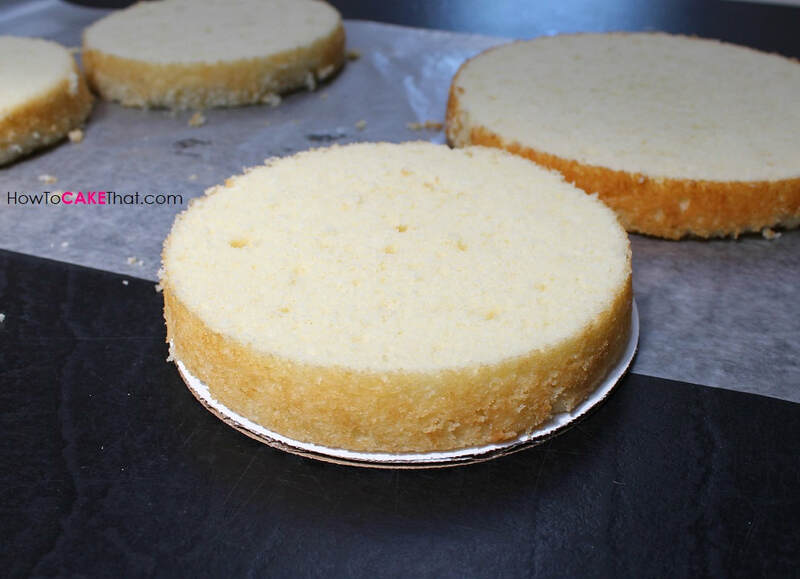 Then, I very lightly used my knife to score a line on the surface of the cake to mark the center (round end to round end - top to bottom in this photo) to make two equal haves. This helped me line up the next cuttings easily. Using the dividing mark I scored lightly on the surface of the cake, I lined my knife up with the end of that line and the edge of my first trimming and sliced away the remaining 4 edges. Next, I used some of the remaining Marshmallow Frosting to smooth a THIN layer over the surface of the cake. 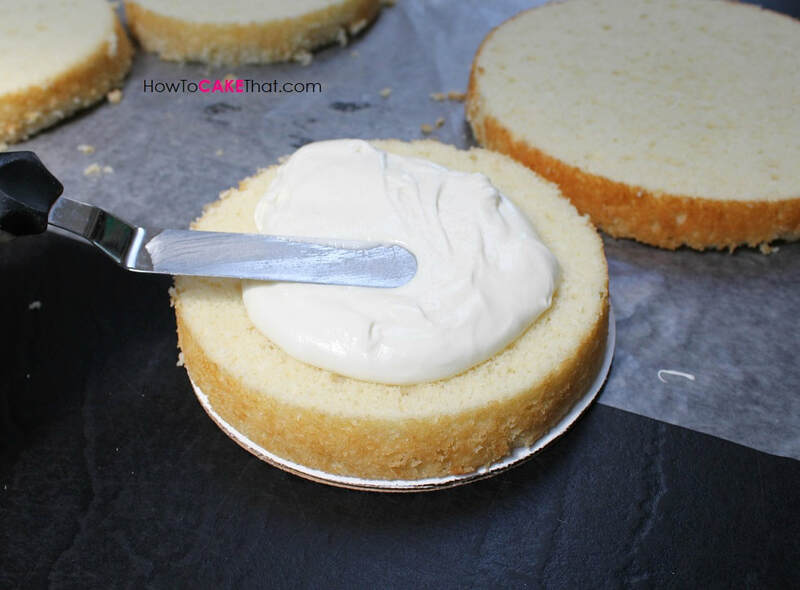 Keep in mind, it was difficult to work with this frosting because it is so soft and sticky. It was difficult to make it smooth. 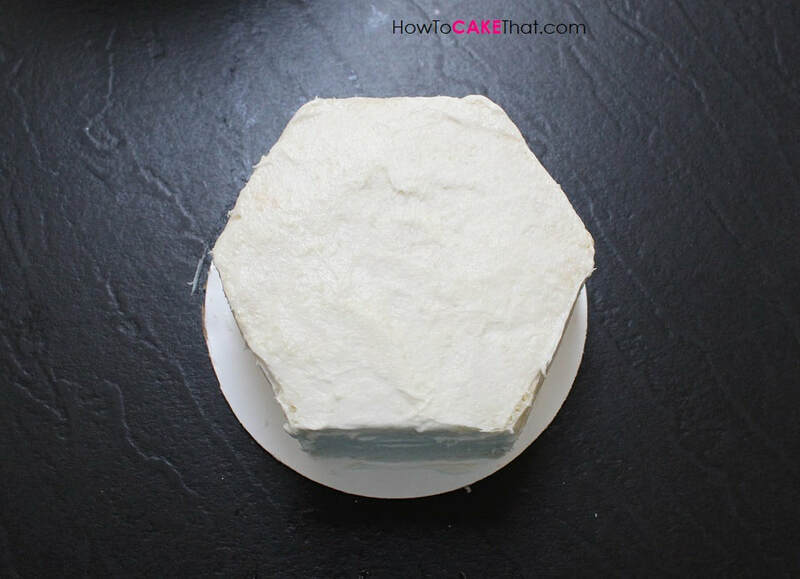 Be sure to cover every nook and cranny of your cake. 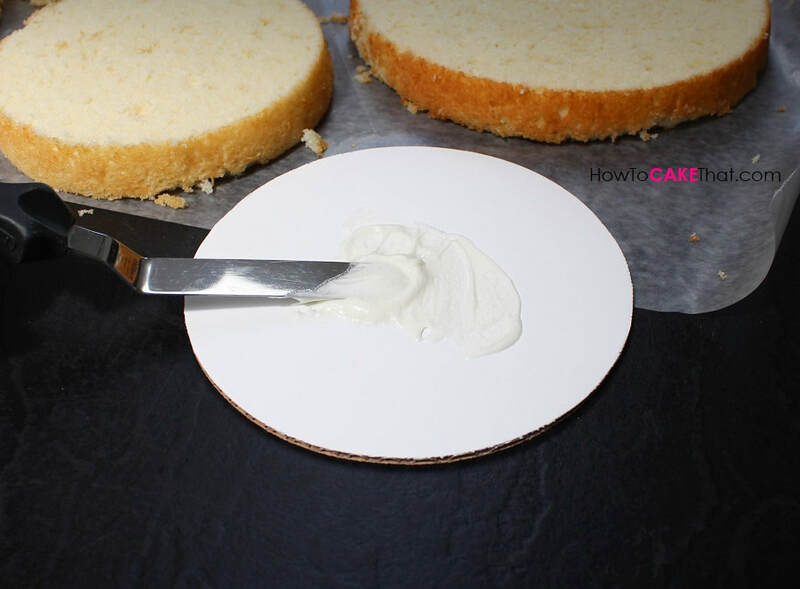 If any cake is left exposed, the ganache may not stick to it and you will have holes in your zebra cake. Now it's time to make the white candy melt pourable ganache. 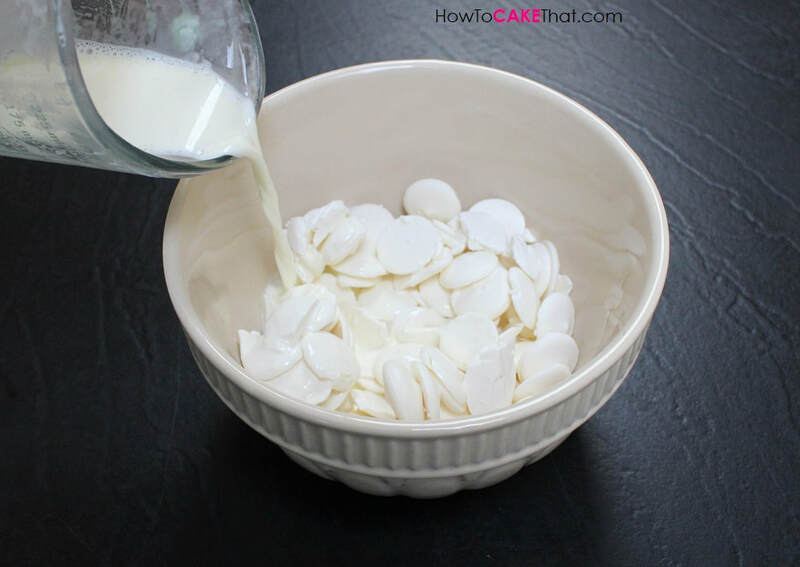 For this recipe I will be sharing how to make the recipe per 12 ounce bag of Wilton Candy Melts. 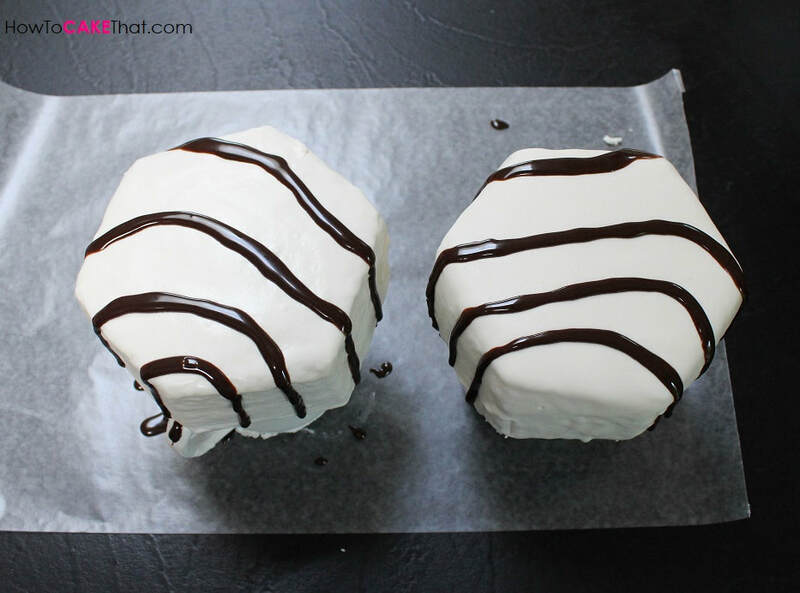 My ganache pouring skills are not that great and my ganache was thick, so I ended up making two batches for these two 6 inch zebra cakes (one batch per cake)... I had quite a bit left over ;). If you are a pro at it you may be able to get away with just using 1 recipe. 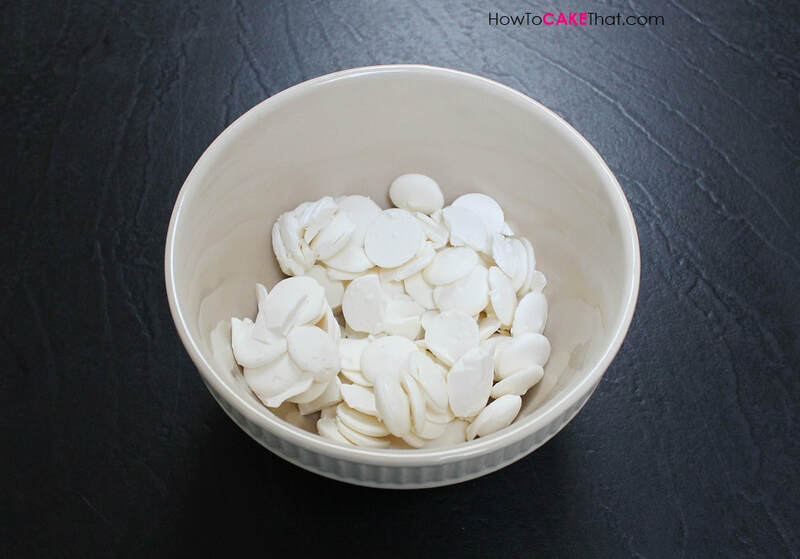 For this recipe, pour one 12 oz bag of white Wilton candy melts into a microwave safe bowl. 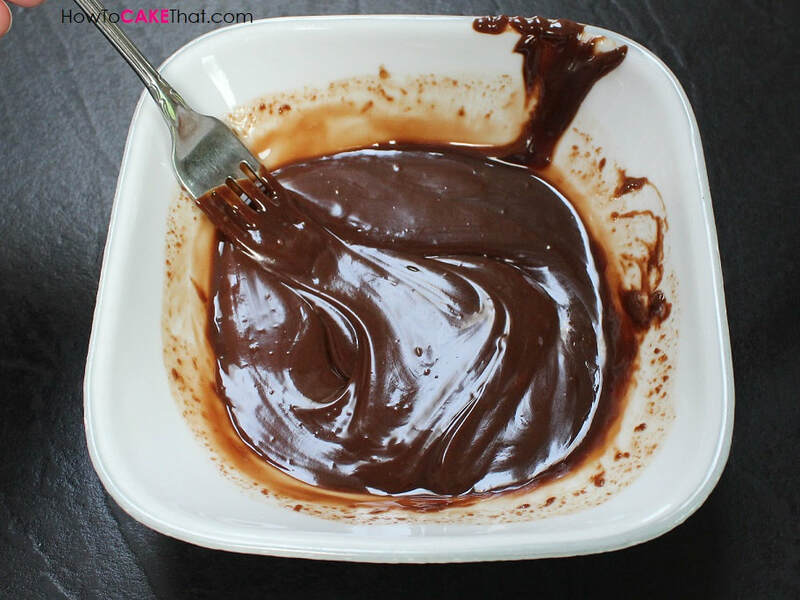 For this recipe I needed my ganache to pour a little thick. So I heated 4 fluid ounces (1/2 cup) of heavy whipping cream in the microwave until it was very hot, but not yet boiling. I poured the hot heavy whipping cream over the candy melts. Then I used my wire whisk to push the candy melts down into the hot cream. Then I stirred the ganache mixture until all of the candy melt pieces were completely melted. My mixture cooled before all of the candy melt pieces had a chance to melt, so I microwaved it for about 15 seconds until the mixture was warm again. Then I stirred until all of the candy melts were completely melted. Now it's time to prepare the cake for the ganache! 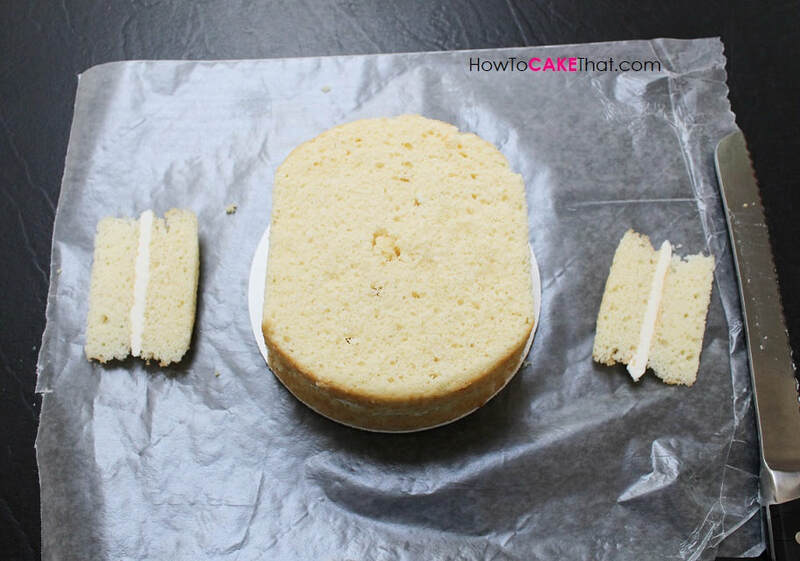 I used a pair of scissors to trim away the extra cardboard cake round. Then I returned the cake to the refrigerator. Next, I set up a ganache station. I placed a small coffee mug inside of a cake pan. 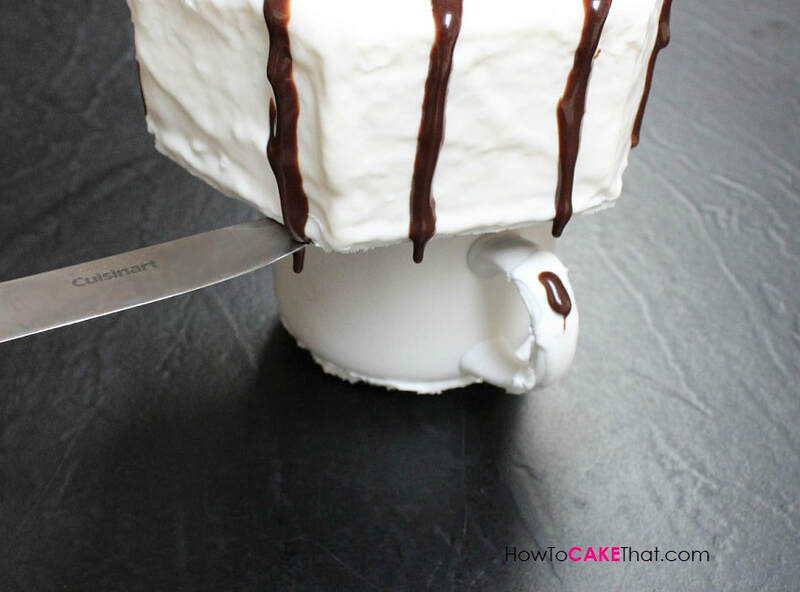 The mug will keep the cake elevated and the pan will catch the ganache drippings. I removed my cake from the refrigerator and placed it center on the coffee mug. Then I poured my ganache over my cake beginning from the center, then swirling my way out to the edges. 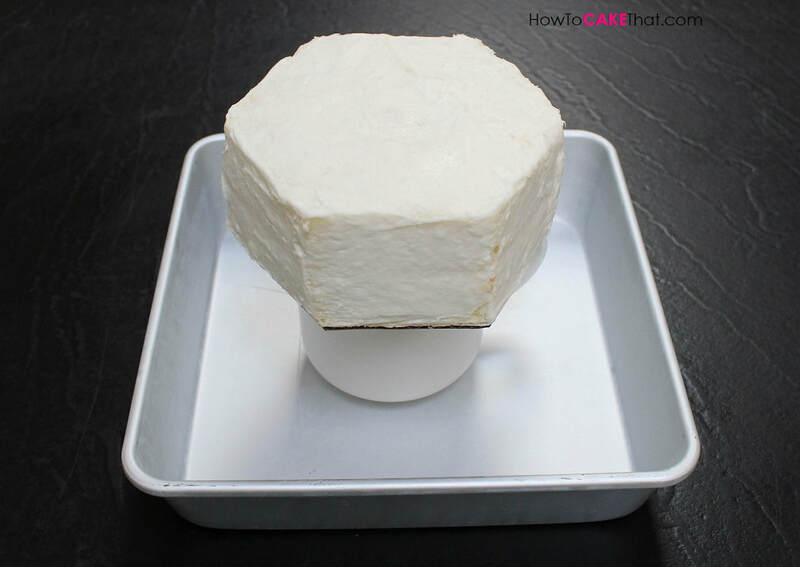 Make sure your ganache has cooled to room temperature or slightly warmer than room temperature. If you need to see a demonstration on how to pour ganache over a cake I found a great video for you guys! 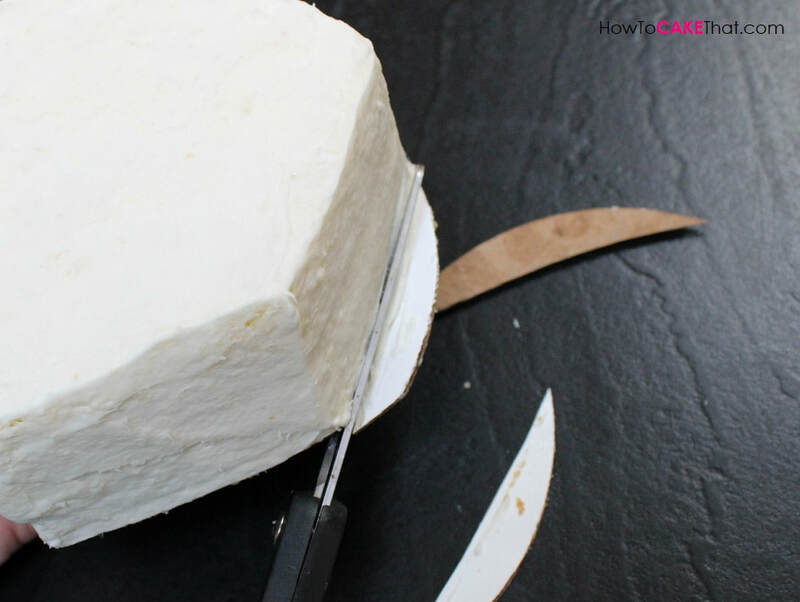 Check it out here: How To Pour Ganache Over A Cake! But don't try to jiggle a cake balanced on a coffee mug... it won't go so well! Lol!! 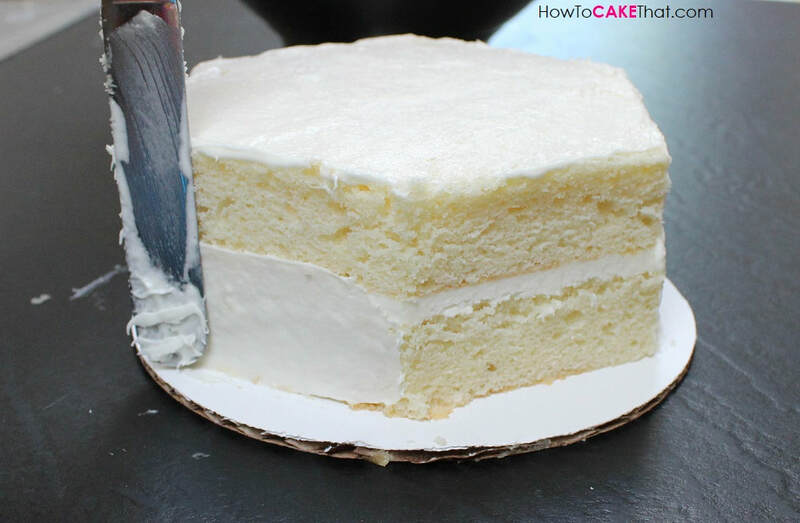 Look at how the sides of the cake are not smooth. 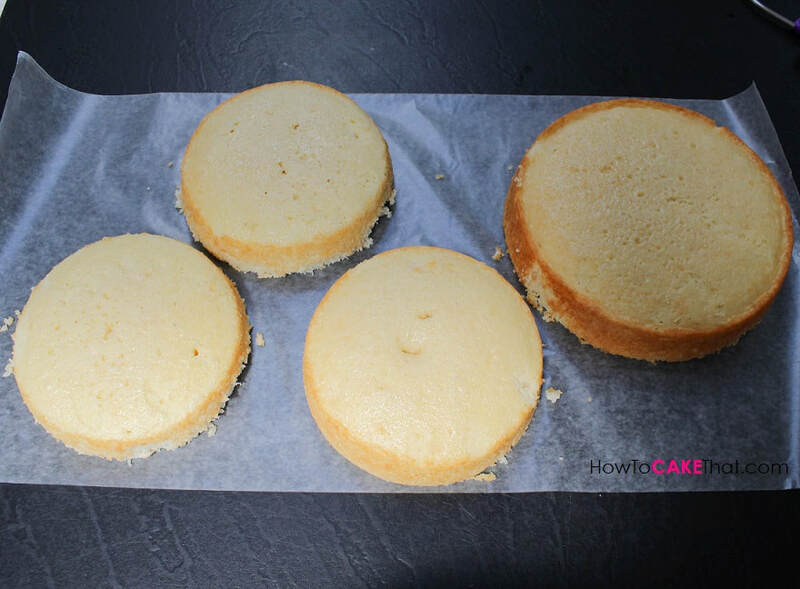 At first I wasn't too crazy about that, but then I looked at my real Zebra cakes I had on hand and I noticed the sides of those cakes were textured just like my jumbo version!! Whoo hoo!! I let the cake drip for about 1 minute, and then I picked up the whole ganache station and set it inside of my refrigerator to set. I didn't want too much of the ganache to drip off. After the cake had set in the refrigerator for about 30 minutes, I used a sharp knife to trim away the drippings from underneath the cake. I left the cake in the refrigerator until I was ready for the next step. While the cakes are refrigerating, I decided to make the chocolate zebra stripes. 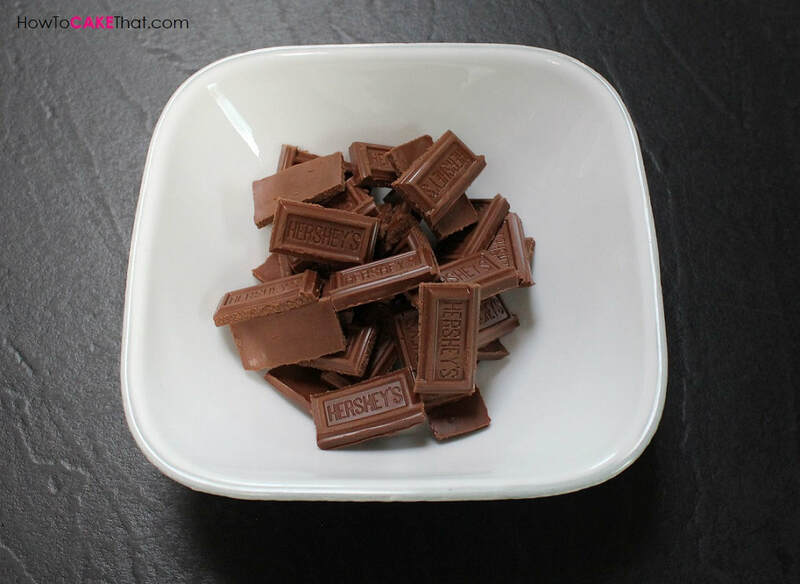 I placed 4 1/2 ounces of Hershey's milk chocolate pieces into a microwave safe bowl. 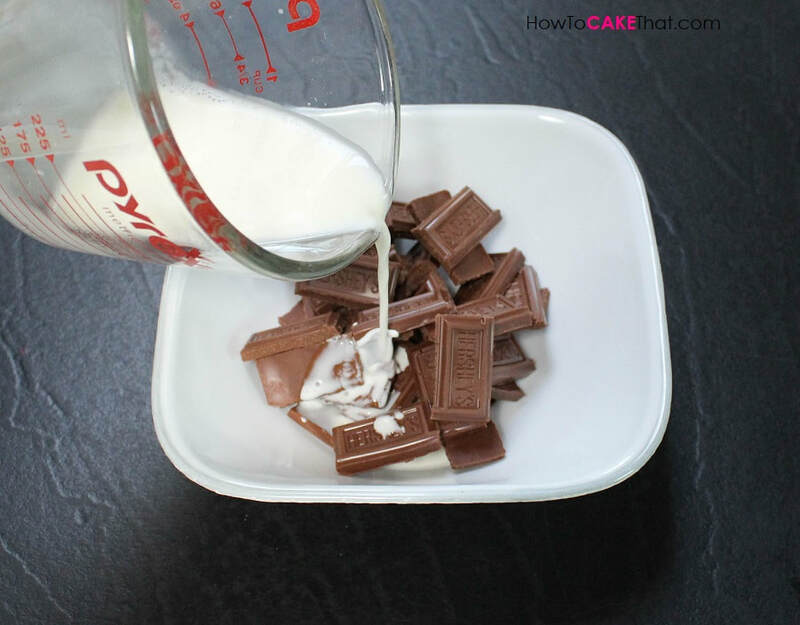 Then I poured 2 fluid ounces of hot heavy whipping cream over the Hershey's chocolate. The heavy whipping cream was heated in the microwave until it was hot but not boiling. Then I used a fork to slowly stir the chocolate and cream mixture until it was well mixed. Also, I noticed my milk chocolate ganache was too light in color for the zebra stripes, so I added a few drops of Americolor Black Oil Candy Color to the chocolate to make it darker. To avoid this step, Hershey's Dark Chocolate can be used to make this ganache instead of the milk chocolate. 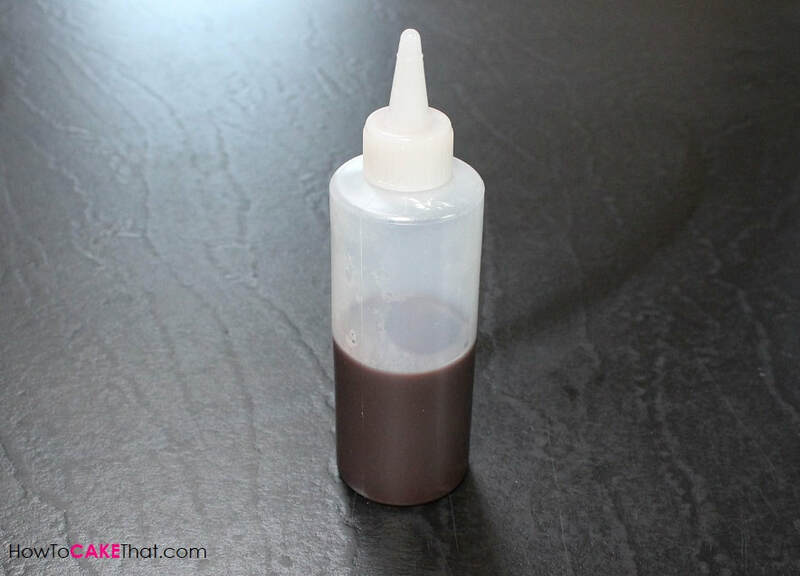 The consistency of this ganache is very much like thick ice cream topping and is best applied using a squeeze bottle. So I placed the ganache into a Wilton squeeze bottle. 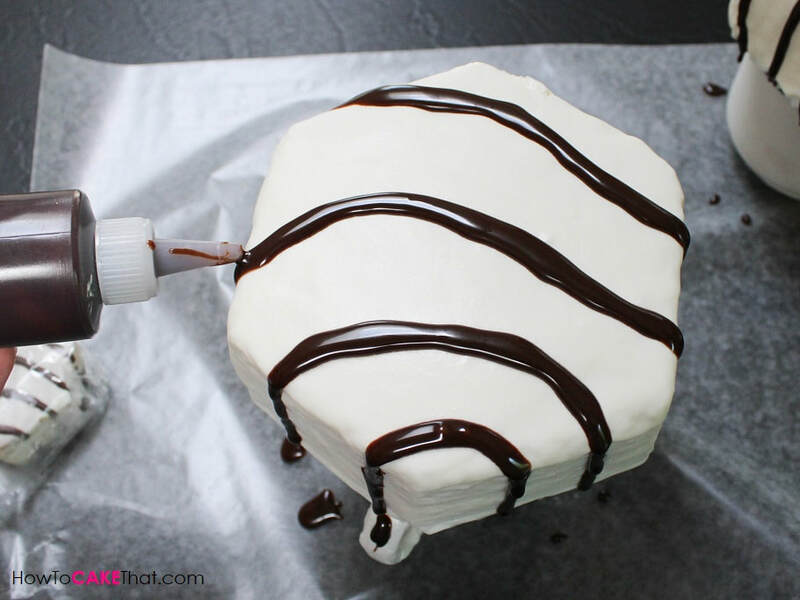 Before applying the chocolate stripes, make sure your chocolate ganache syrup is room temperature! Also, I recommend having a pack of zebra cakes on hand to look at while you are adding the stripes. 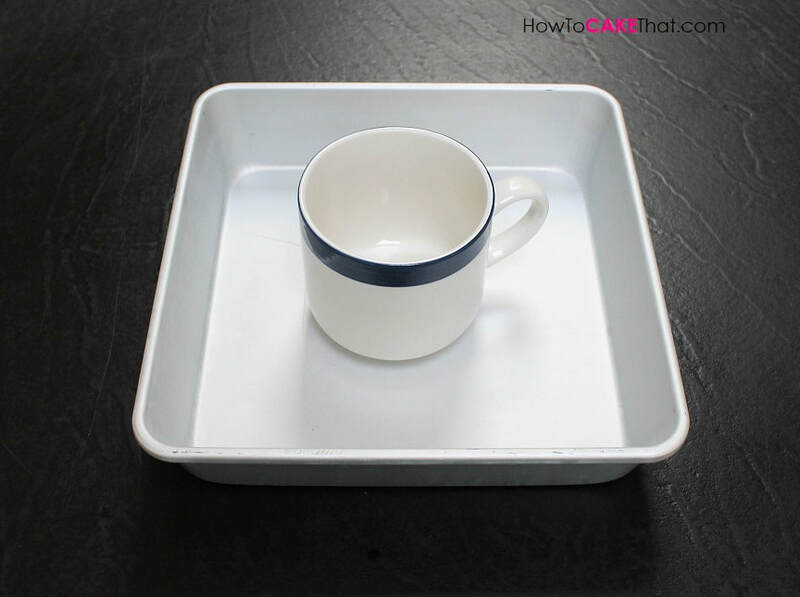 Then remove the cake from the refrigerator ensuring it is still sitting on the coffee mug and set it on a sheet of wax paper or other paper to catch the drips. 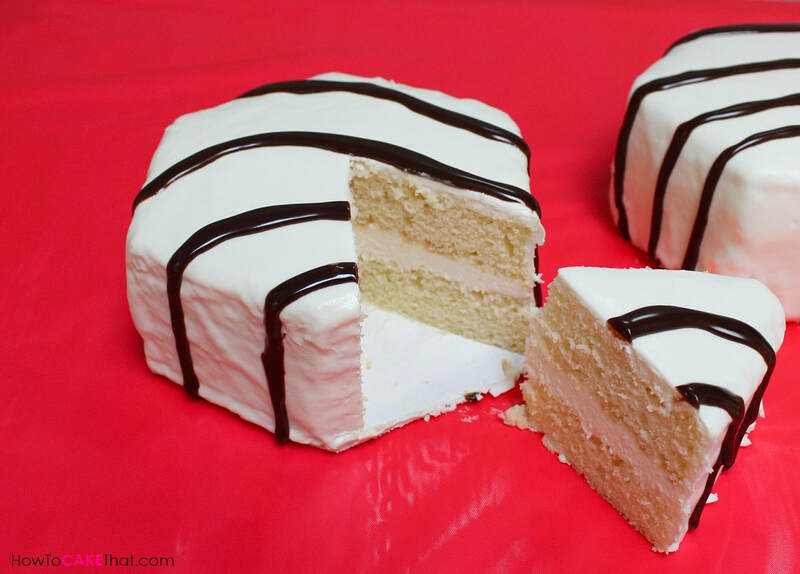 Then draw the stripes over the cake with the chocolate ganache syrup. Ooooh!! Don't they look yummy!! Let the chocolate stripes drip for about 30 seconds to a minute, then carefully move the cakes to the refrigerator (while they are still sitting on the coffee mugs!) to firm up the chocolate stripes. Once the chocolate stripes have chilled, remove the cakes from the refrigerator and trim them using a sharp knife. Lookeee!!! Don't they look so yummy! !